On contacting (dielectric) surfaces static charges accumulate – causing a phenomenon known as ‘static electricity’. Although it is so common, the mechanism of static charge formation has been debated for centuries, and it is still unclear. A tiny electrical shock that zaps you on a dry winter day might just feel uncomfortable. Those ‘shocks’, when they happen in the industry (polymer, plastics, and drug manufacture, air and space etc.) can cause multibillion-dollar losses. So far, this problem was handled by doping dielectrics (usually polymers) with additives that render polymers conductive, which helps to prevent accumulation of surface charges. However, making polymers conductive is not practical for most applications, e.g. in electronics. 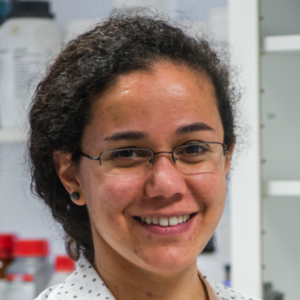 Previously, we made an effort to mitigate charges on polymers without changing their electrical properties, by doping them with radical scavengers. Radical scavengers remove radicals co-created with anions and cations (which are indeed ‘the charges’ on the polymer surfaces!) upon bond breakages. The removal of radicals destabilizes the charges on polymer surfaces. This indirect way of static electricity prevention is then proper for many industrial uses. However, this one, too, can only provide permanent prevention of charge accumulation – it does not allow for spatial and temporal control. 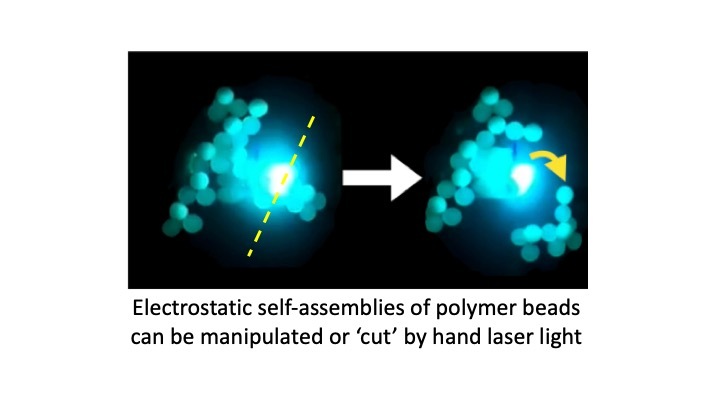 With our new report in Nature Communications, we show a method for temporal and spatial control of surface charges on common polymers by using light, which allows a straightforward method to eliminate charging and manipulate charged objects. 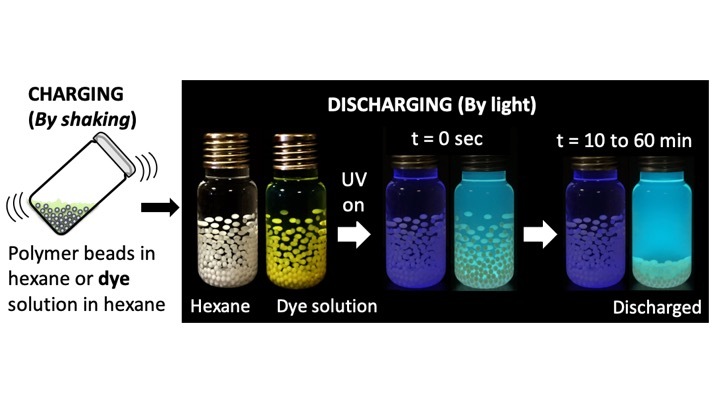 Our method uses photo-excitation of organic dyes, by which we also gain a ‘wavelength’ control, in addition to temporal and spatial control because the dyes can only be excited to their ‘mitigation-active’ states by wavelengths matching their absorption profile. We showed that the new method is applicable to polymers in the solid state if it is possible to mix dyes into the polymers. To investigate the discharging mechanism further, we used another setup, where we charged millimeter-scale polymer beads by shaking in glass vials filled with the solutions of various dyes (Coumarin 6, Nile Red, BODIPY and Pyrene). The charged beads stuck to the walls of the vial because of electrostatic adhesion. This time, upon illumination with proper wavelengths of light, we detected fast discharging of charges on the beads (the beads fell down to the bottom of the vial) only in vials with dyes, which have polar excited states. We surmised that the mechanism behind this phenomenon was the increase in the polarity of the dye upon excitation, which acts as a discharging mediator. In our work, we also made simple demonstrations for spatial control and manipulation of electrostatically assembled structures by using light. The individual discharge of beads and manipulation (cutting/trimming) of the assembled structures were achieved by using a simple laser pointer. We hope that this newly discovered spatial, temporal, and wavelength control of surface charges by light will provide new insights into the ancient enigma of static electricity, its prevention and mitigation. H. T. Baytekin et al. Science 333, 308 (2011). H. T. Baytekin et al. Science 341, 1368 (2013). K. Sayfidinov et al. Science Adv.4, DOI: 10.1126/sciadv.aau3808 (2018). S. D. Cezan et al. Nat. Commun. 10, DOI: 10.1038/s41467-018-08037-5 (2019).